What's new in Node.js 10? 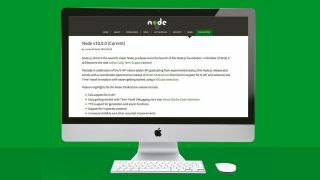 20 tips and techniques to help you master the latest version of Node.js today. Thus, one of the recurring topics of the Node.js world revolves around reconciling differences between 'web development' and 'node development'. For example, the module subsystem of Node.js does not work according to ECMAScript standards. Node.js 10 updates the versions of various core components used in the product, thereby enabling developers to harness speed and security improvements. Furthermore, work on HTTP/2 speeds up delivery of content in bandwidth- and/or latency-constrained scenarios. A change in the native interface will simplify the life of Node.js plugin developers, leading to a more vibrant extension ecosystem. The highly detailed technical nature of the changes makes providing individual examples difficult. However, in this post we've rounded up 20 short tidbits of information that will help you get to grips with Node.js 10. Should you feel like always staying on top of the latest developments in Node.js, head to this GitHub page. It provides an intimate level of detail on changes in the product. Node.js can be compiled by hand. However, most Linux distros are able to run an automatic installer. The code here shows the installation process on Ubuntu 14.04 LTS. If your operating system shows up in Fig. 1, find a similar process here. Developers have performed string comparisons to find errors ever since Node.js 1.0. Version 9.0 started to shift to easier-to-handle constants, however. The code accompanying this step is immune to spelling mistakes and is resistant to attempts 'to improve usability by reformulating error messages'. Process computer programmers baulk at the idea of using strings to transmit error states – Node.js 10 does not break this tradition. Instead, the framework defines a few dozen strings, which will serve as a 'magic constant' and can be returned in the code field of the 'Error' object. The introduction of error codes does not deprecate traditional error messages. Code based on the presence of the '.message' field continues to perform just as it did – should you need to present a message end users can understand, you can trust the field just as you did before. Try-catch blocks are the bane of Java programmers: finding one marked with a comment instructing to shut the compiler up is common. V8 6.6 reduces the burden of unwanted try-catches by letting developers omit the exception object from the catch block. Thankfully, N-API solves this problem by providing a new abstraction layer. Any changes made to the underlying platform and tooling are no longer exposed to developers working on plugins, thereby lowering maintenance burdens and, hopefully, making Node.js upgrades smoother. As far as C APIs go, the N-API is clearly among the better-designed ones. As shown in excruciating detail here, the API comes equipped with methods for handling object creation, callbacks and more. Furthermore, the header contains a 'lock' permitting you to disable features not found in older versions of the NAPI for compatibility reasons. Cryptography always was of significant importance on the web. Node.js 10 updates the underlying version of OpenSSL to 1.1.0, thereby enabling developers to use new encryption algorithms, which are expected to be more robust. This is especially helpful when seeking to implement AEAD-type encryption schemes. Node.js 10 emits a set of additional tracing parameters, thereby letting developers zero in on performance problems. Trace objects can furthermore be enabled and disabled at will via the functions shown in the snippet accompanying this step – pinpoint accuracy is now at every developer's fingertips. As of this writing, Node.js supports a total of eight trace types. In addition to V8 events, developers can also register themselves for bootstrap, async_hook and file system sync information at the command line or via the trace object. While the API stability indicator in the Node.js documentation still shows HTTP/2 support as being experimental, the API can be considered stable. When implementing a Node.js server which uses HTTP/2, do bear in mind that the unencrypted version of the protocol is not supported by any web browser as the time of writing. Because of this, you should be prepared to deal with significant processor overhead when transmitting and receiving data in proxyless configurations. Node.js is single-threaded by default. Async hooks enable code to keep an eye on asynchronously-executed resources in a more comfortable fashion – while the API is far from stable, Node.js 10 provides significant improvements over the barely-working implementations found in previous versions. While NPM is usually seen as constitutent part of the Node.js distribution, it is actually a standalone product. Current versions of Node.js 10 come with NPM 6, which offers significant speed increases when installing and deploying packages. On this writer's machine, some processes saw tenfold speed increases. This article was originally published in creative web design magazine Web Designer. Buy issue 279 or subscribe.